103deg. is forcasted for tomorrow. Overcast, with patchy drizzle in the north. Northerlies, strong in exposed places. Cloudy. Drizzle turning to rain in the afternoon. Northerlies, gales in exposed places. But it's a dry heat, man. 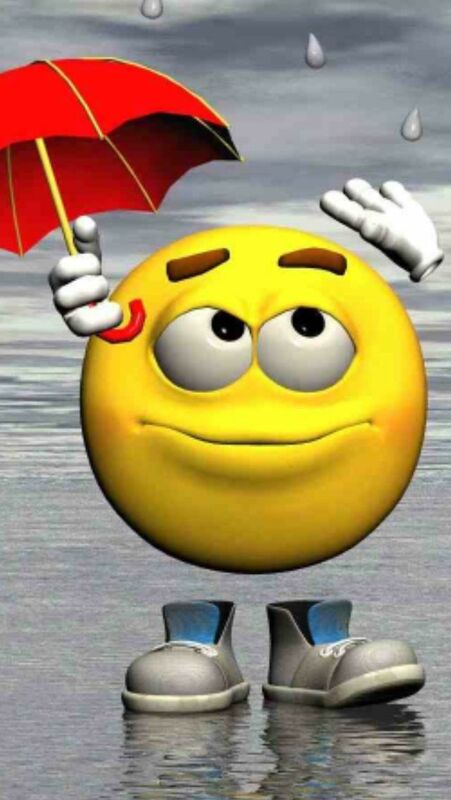 Rain Today: 0.0 ????? "yeah right, we're in the middle of a hail storm right now, heavy rain almost zero visibility and a big dollop of thunder and lightning for good measure"
you can see my house down there , the one with the white door ! Big news on french media this week....Be careful it's hot outside. Well yeah it's hot (38°C in the shade), but it's summer for fucksakes! Ever since 25000 seniors kicked the bucket in the summer of 2003, the governement puts out warnings when the temp goes above 30°C, and then the you get the "it's global warming" spew from the "scientist talking head". 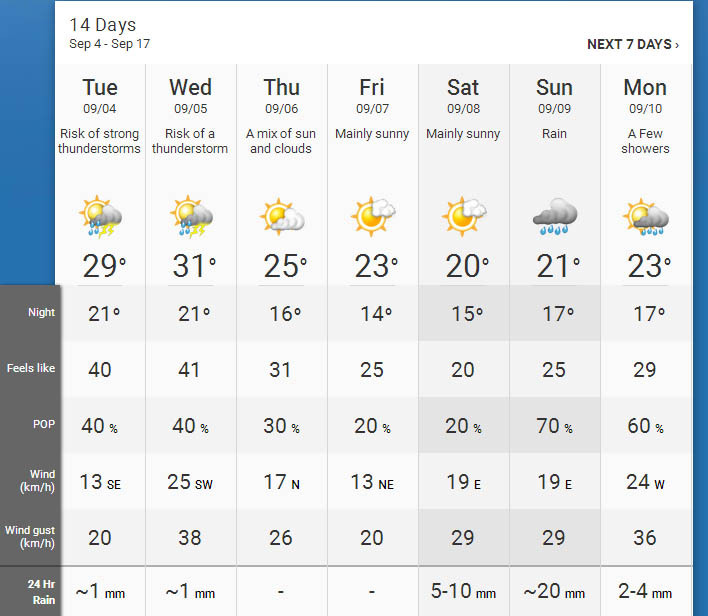 I'll be in my beloved Ardèche home for the next 3 weeks and the forecast is for some 40°C or more sunny awesomness. Bloody lovely , thanks . Periods of rain. South easterlies. Often cloudy. A few showers until evening. Southeast breezes. Post subject: Re: lol...how crazy is this weather? Periods of rain, with heavy falls, especially this evening. Gale southerlies, gusting 120 km/h (74.5 mph) in exposed places. Periods of rain. Southerlies, gale in exposed places gusting 120 km/h (74.5 mph) in the morning. Overcast with showers, then rain from evening. Northerlies picking up, gusting 90 km/h from afternoon. New Zealand's weather appears to have a mind of its own as a new week gets underway. There are 20°C (68°F) swings across the country on Monday and, incredibly, temperatures are both hotter and colder than average at the exact same time. "Some parts of New Zealand are several degrees above average right now while others are several degrees below normal at the exact same time," Weather Watch says. "Some have even reached 23°C (73.4°F) across parts of the North Island while at the same time a wintry southerly moves up the lower South Island, bringing snow for some areas down to just a few hundred metres." The strange effect is due to sub-tropical northerlies coming down from just south of Fiji into the northern half of New Zealand, pushing temperatures up. At the same time a southerly change in the South Island is dropping temperatures to a few degrees below normal for mid-September - and as low as 3°C (37.4°F) in Central Otago. NIWA has forecasted a decent late-season snowfall in the Southern Alps as the mercury falls. 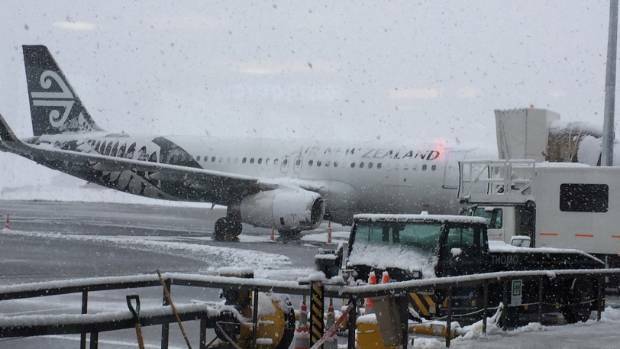 Images show snow falling at a "fast and furious pace" in Queenstown, closing the airport. The snow has stopped falling in Queenstown. Heavy snow at Queenstown Airport on Monday morning. 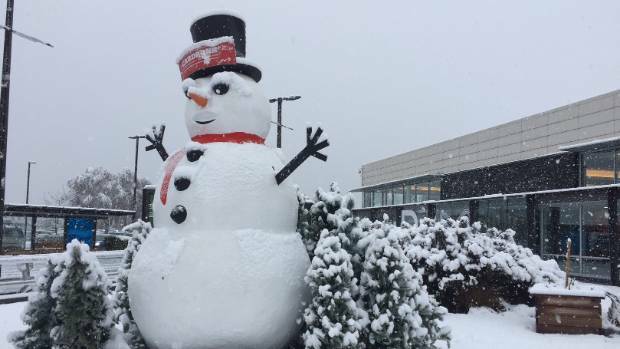 Queenstown Airport remains open despite the snow. 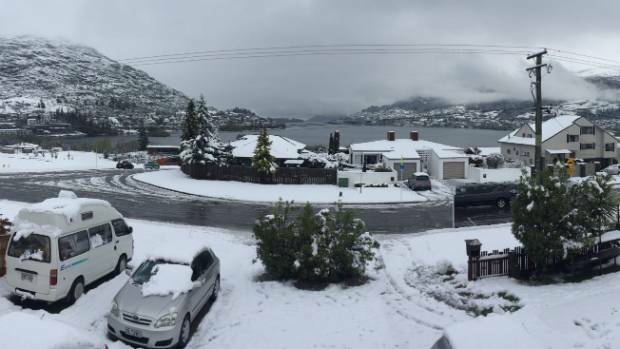 Snow in the Queenstown suburb of Frankton. My prediction is the colors are gonna pop pretty good, all trees near the same time, but it will probably be around the weekend of Oct 27th here in sunny Connecticut. Today's Forecast: Fine. Southerlies dying out in the evening..
Sunday's Forecast: Fine apart from evening cloud. Northerlies. I'd say so Gray_Ghost, hot summer gone in the Northern Hemisphere, days now 63/17 to 73/23 here in the Northeast US. I'm in my usual denial, it's still summer, it's still summer. Yeah on the clocks, our loss is your gain, soon my after work bike rides will be plunged into darkness, not to emerge 'till March. The above was all deep lush green 2 weeks ago. Central and southern parts of New Zealand are warned to brace for strong winds and heavy snow on Friday night and Saturday. Severe weather warnings have been issued by the Met Service, with strong wind warnings for Taranaki, the Kaikoura coast, Marlborough Sounds and Wellington. 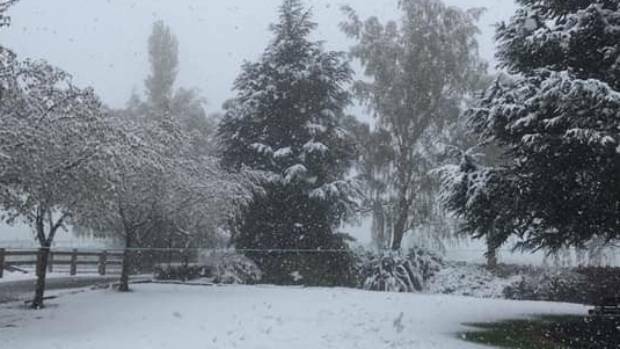 A heavy snow warning was also in place for Marlborough south of Ward and for Canterbury. 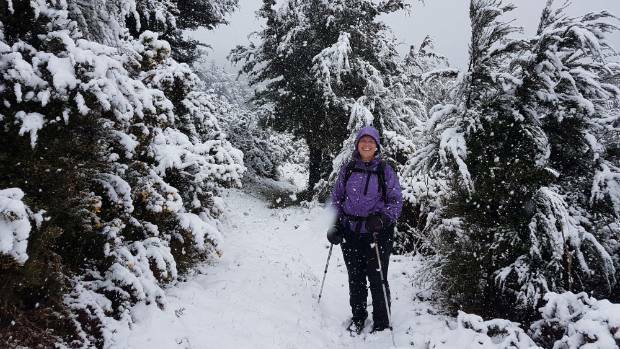 Angela Grigg experiencing snow on Mt Oxford in Canterbury. Heavy snow watches have been issued for the ranges of northern Hawkes Bay and southern Gisborne between Mohaka and Wharekopae, and also for Taihape, while a strong wind watch is in place for Westland. 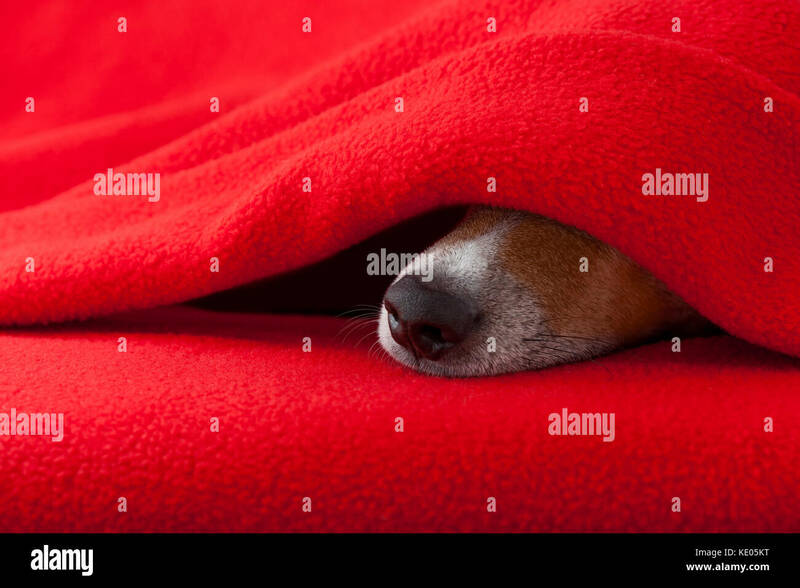 "A trough of low pressure, followed by strong cold southerly flow, moves east across northern New Zealand tonight (Friday)," the Met Service said. "Snow is expected to low levels over many parts of the upper South Island, and severe gale southerlies for parts of central New Zealand." 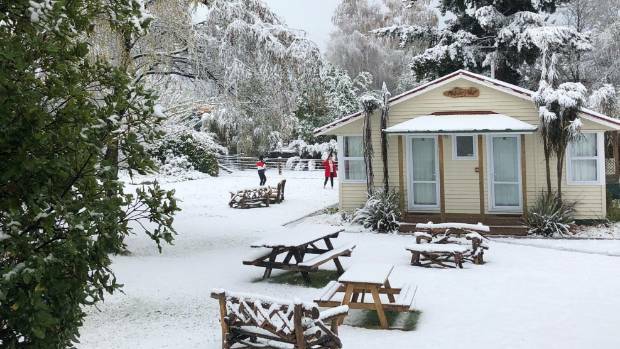 Heavy snow was expected in Marlborough, south of Ward, in the 10 hours from 8pm Friday to 6am on Saturday, with a further 10 to 15cm of snow expected to accumulate above about 500 metres with lesser amounts down to 300 metres on top of what has already fallen. In Canterbury, for the four hours from 8:00pm Friday to 12:00am Saturday, a further 5 to 10cm of snow could accumulate above 500 metres, with lesser amounts down to about 300 metres on top of what has already fallen. The heaviest snow was expected to ease by midnight, however, a few light snow showers may continue through to early Saturday morning. The snow could disrupt travel, damage trees and power lines, and the cold condition could cause stress for livestock, the Met Service said. Taranaki was warned to expect severe gale south easterlies for the six hours from 8:00pm Friday to 2:00am Saturday, gusting to 120 kmh in exposed places, especially about and north of Mt Taranaki. The Kaikoura Coast, Marlborough Sounds and Wellington could expect severe gale southerlies gusting 120kmh (74.5 mph) in exposed placed for the three hours from 8:00pm to 11:00pm Friday. 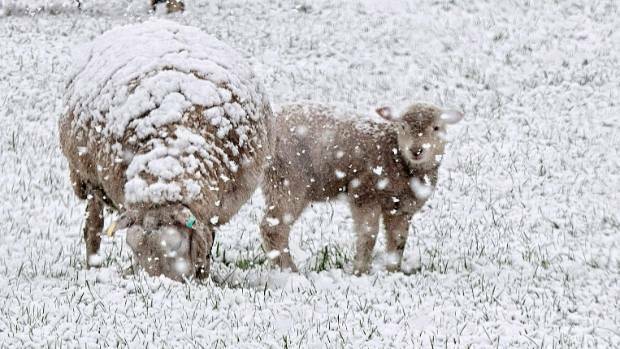 Snow was also expected in the ranges of northern Hawkes Bay and southern Gisborne between Mohaka and Wharekopae for the 12 hours from 1:00am to 1:00pm Saturday. Snow was expected to lower to 600 metres overnight, with heavy falls possible above 800 metres. Snow accumulations may approach warning criteria above 800 metres. 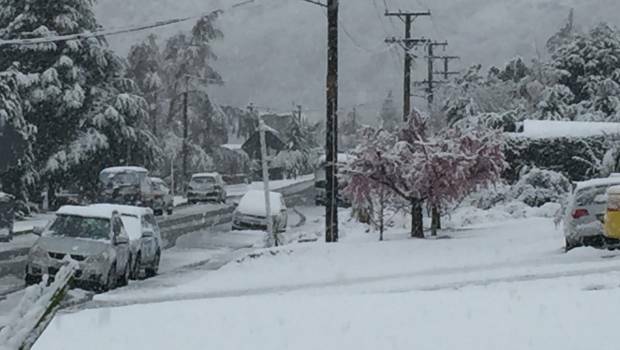 For Taihape, in the eight hours from 11:00pm Friday to 7:00am Saturday snow was expected to lower to 600 metres overnight, with heavy falls possible above 800 metres. Snow accumulations may approach warning criteria above 800 metres. In Westland for the five hours from 8:00pm Friday to 1:00am Saturday, south easterly gales may become severe in exposed places. Spring snow in Lake Tekapo Village. 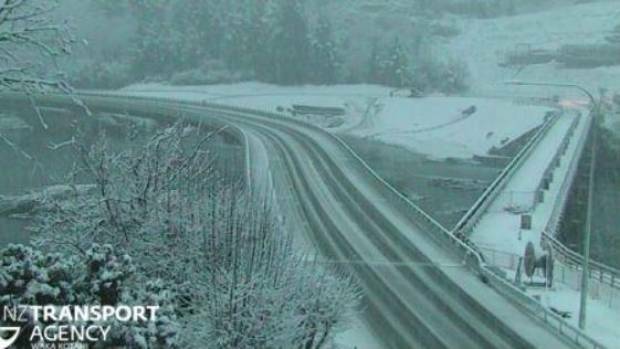 Snow falling in parts of the South Island earlier this week. and of course the obligatory lamb and sheep in the snow. We've got lightning and thunder in SoCal. With moderate wind and rain, so far. Right about now: 6°C (42.8°F) feels like zero! A few showers, clearing in the afternoon and fine spells increasing. Southerlies gradually easing. Often fine. However, some early cloud, and the chance of afternoon showers in the north. Southerly breezes. Offshore winds with temps in the mid-eighties this week for SoCal. 24°C (75.2°F) and the sun, after such a long absence, is vicious.....I love it. Fine apart from evening cloud and light northerlies. We had a mini heat wave last week. That, and feedings, should help my pepper garden produce again. The low temps back east will probably effect any SoCal sports team visiting to the north. I hope the rain misses Boston.